Last updated 12 February 2019 . By Georgia Evans. As bitterly cold winds continue to hit the capital, sigh, it’s an absolute must to find good restaurants that serve up fulfilling comfort food. So, in an effort to dispell those winter blues, we deemed it absolutely necessary to check out the brand-new flagship site of vegan curry creators and festival favourite SpiceBox, to see if we could find the perfect fix in the heart of Walthamstow. Upon entering the cosy, brightly coloured pink and orange space, SpiceBox immediately gives you a local curry house kind of vibe. Families were sat around chatting, friends were meeting, and first dates were heating up, with members of staff and owner Grace Regan chatting among excited diners. Saying this, the sense of homeliness does not detract at all from its style, as Indian-inspired artwork and fashionably colourful prints lined the wall, with a large glass ceiling and hanging plants that enhance the open feel of the space. 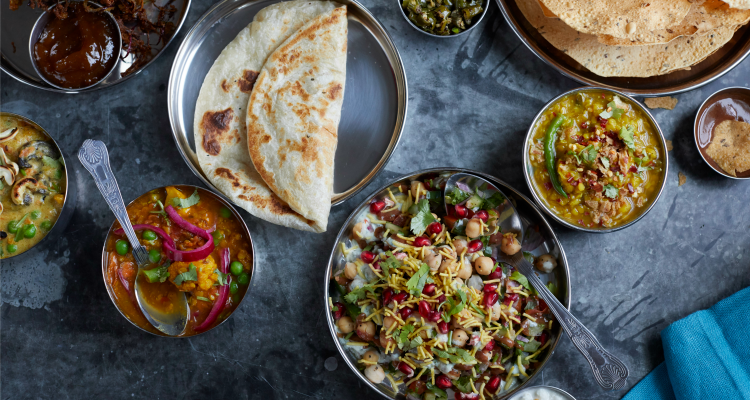 The 100% plant-based menu is what’s made SpiceBox a hit at music and food festivals, with a carefully-curated menu of Indian classics given a modern, vegan twist. 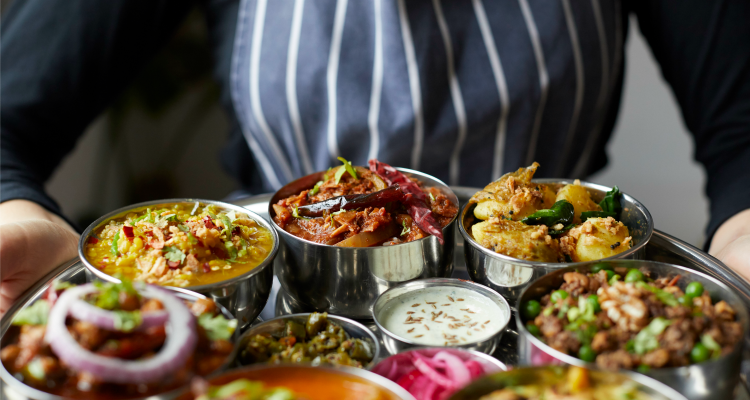 Star dishes include mouthwatering starters such as the sharing street tiffin (£15), served in a traditional metal tiffin, with homemade baked samosa, crunchy onions and a wonderfully zesty mint dip to contrast the flavours. The jackfruit jalfrezi (£7) fulfilled its purpose as a perfect winter warming dish, with just the right level of heat and soft jackfruit that melted in the mouth. This was a perfect accompaniment to the delicate sweetness of the ‘chicken’ tikka (£9), with the award-winning tarka dhal (£4) rounding off a harmony of flavours. To finish, the biscoff and cardamon paratha (£6) was an absolute must-try, offering a light finish to the feast we had just embarked on. Food is served in pickle trays and karahi, a nice nod to tradition. As we wrapped up to face the cold outdoors, it felt like a real shame that we had to leave this wonderfully cosy retreat. This was not helped by the knowledge that we had to travel an hour and half to get home, double sigh. Nevertheless, I’m definitely willing to make this trip again (and face the elements) as this place really is worth it. Spicebox is a cosy hideaway, with a bright welcoming feel by day, and an intimate atmosphere once the sun goes down. With a menu of creatively re-invented Indian cuisine, that just happens to be vegan, this curry house is serving up mouthwatering dishes that could impress even the most devoted meat-eaters.